Sometimes the best support means getting out of your customer’s way. 04. What type of help content should I create? It’s an inescapable fact that some customers simply don’t want to talk to you. Maybe they’re busy and don’t fancy hanging around for a response. Or maybe they just prefer to learn things for themselves rather than have answers spoon-fed to them. Whatever the reason, educational and motivational help content is your best friend. It will help your new customers get over those first few hurdles and give your seasoned customers a way to level up from amateur to expert. Even though help articles are the first point of contact when someone hits a stumbling block with your product, they’re usually a thing of boredom. Dry and hard to read, most help articles haven’t evolved from a time where software was shipped in boxes. Creating help articles people actually want to read takes sincere effort. To do it you’ll need to be informative, engaging, unquestionably clear and mindful of how and why a customer searched for help in the first place. But put in the effort up front and you’ll be able to to provide great customer support at a large scale and at a lower cost than every other support channel. In this guide, we’ll share tips and templates so you can start creating effective, coherent help content that will benefit both you and your customers. To continue learning about writing great help content, and gain access to all future starter kits, enter your email below. Help content shouldn’t stop at customer support. It’s often the first point of contact for prospects too, so make sure you’re creating help content that engages at every stage of the customer lifecycle. Almost all the examples we use in our help content are taken directly from our customers. That means actually talking to them and listening to their stories. When a customer runs into trouble, they’ll have real-life examples, not abstract use cases others can’t relate to. Your colleagues are (hopefully) experts on your product. Chances are they’re using it in creative ways your customers would benefit from. Getting first-hand experiences from the experts of today can help you create valuable content for the experts of tomorrow. People don’t search for your solution, they search for their problem. This means translating your product’s concepts into customer-friendly language. For example, if your customers are searching for “Cannot create new project”, you don’t want to be writing articles about “Scaling database errors”. Using images, videos and gifs removes the need for enumerating steps or writing overly wordy descriptions. Why waste your customer’s time with a few paragraphs of text when you can quickly show them what to do. Use tools like Skitch to create screenshots and LICEcap for gifs so potentially complex ideas can be comprehended quickly by your customers. Once help content is published, don’t let it go stale. Establish a recurring schedule for comprehensively reviewing highly trafficked articles which are also high value to your business. A freshly shipped feature could impact or improve how you describe a workflow. 04 What type of help content should I create? 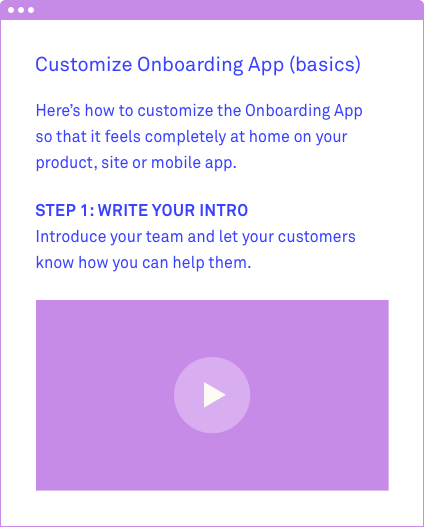 Help articles are invaluable to onboarding new customers and users; in fact, they usually serve as a warm and friendly first impression. Create a “Getting Started” guide that’s brief and clear. It should only include the bare essentials for getting started, e.g. installing, configuring, and using your key features. It should not be an exhaustive list of everything they could do on day one. Kathy Sierra puts this best - what can you write that helps new users to experience success within 30 minutes. Keep instructions short so customers can get set up right away and start getting value out of your product. Complement your guide with a short video to walk your customers through key workflows. When you simultaneously show and tell with video, ideas are communicated and understood quicker. Use tools like Soapbox to reduce the cost of producing these videos. Remember, you’re not trying to win an Oscar for cinematography here. It just has to be helpful. If you’ve ever jotted down your grandma’s famous meatball recipe or shared do-it-yourself instructions with a friend, you already understand the basic structure of how-to writing. A good how-to is written as a sequence – first you do this, and then you do this. The essential question to ask yourself when writing a how-to is “What happens next?”. Keep answering that question over and over again and you’ll have a good how-to in no time. This is particularly good for tricky workflows such as installing your product, where multiple linear steps are required. Additionally, talk to your customer support team to find out where your customers are getting stuck and prioritize creating individual how-to articles for each of these use cases. Writing a killer “how-to” title for your help content is key. The more you focus on the benefits to the reader in your headline, the more readers you’ll have. For example, “How to avoid spam filters and get your messages read” rather than “How to keep your spam complaint rate low”. Once somebody’s learned the high-level concepts of your product, they’re going to need to dive into the details of some area or another. This is often when your user’s progress comes to a screeching halt. Troubleshooting articles are a great way to document issues and provide immediate help to common or easily solved problems, letting you save time and effort for more important endeavours. For example, if it’s common for customers to get an error when importing their data, create an article that shows them the top five things to try fix it. 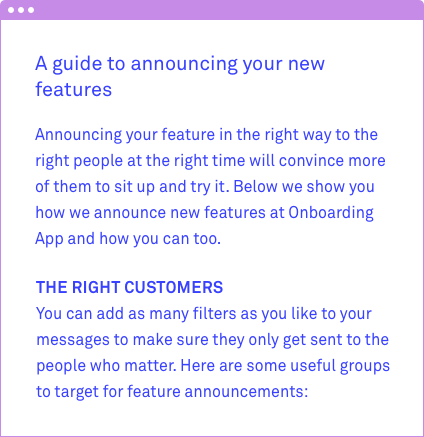 Pay attention to the conversations customers initiate from your troubleshooting articles (that's one of the cool features of Intercom's Articles product) and then improve your content based on the actual problems customers are encountering. The painfully obvious solution is to include real frequently asked questions. Create FAQs to try and proactively answer common questions customers ask. (Talk to your support team if you’re unsure what these questions are). For example, you could outline a workaround for an issue many customers are experiencing. Or you could explain why you haven’t built a feature customers are experiencing. 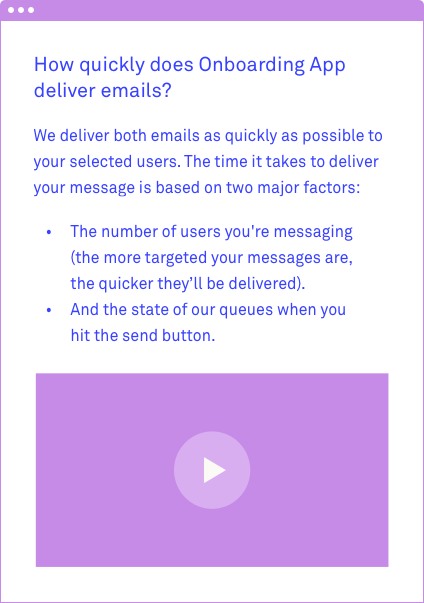 Or you could explain why you haven’t built a frequently requested feature. Keep your FAQs short and skimmable and avoid overloading them with unnecessary information. Instead, use links generously to route users to other useful help articles that go into more detail. The goal of good help content shouldn’t just be to answer the most common customer problems. It’s to act as a motivational GPS that keeps your customers stampeding towards success. By proactively teaching your customers how to do more, they find out new things – and get more value. As they find more value, they become more embedded. As they become more embedded, they’re likely to advocate for your product. Best practice articles are the simplest way to get them on the path towards expertise. Start by sharing tips on how you use your product, but also ask your team, and even your customers, for their best-practice tips. Share real-life customer examples (not abstract use cases customers can’t relate to). Interview your team to discover their expert advice for how they use your product. Your article title and subheadings should focus on the job your customers want to do, not the feature they want to use. For example, “Tracking your project’s progress” is a good title for a best practice guide. “How to use ExampleApp’s tracking feature” is not. When Figma launched out of private beta, we relied on a simple help center created using Jekyll. The goal was simple: make sure users had the basics they needed to get up and running and start designing in Figma. The problem was that most of the articles were written by our engineers. The language was relatively technical, informational and dry. Sure, people could familiarise themselves with the core features and functionalities but it was not particularly enjoyable to read, nor did it motivate people to become power users of our product. Our help center also couldn’t scale as our customer support team grew. There wasn’t a non-technical way to add images to appeal to visual learners which meant our help center was 99% text based. New content, and updates to existing content, needed to be added using Github and required using HTML and/or Markdown and submitting pull requests. Let’s face it, nobody wants to be messing around with the command line when you should be focusing on educating and supporting your users. Once we switched to Intercom Articles, we built a help center that had a much lower barrier to entry for our support reps, which in turn meant we could spend more time writing help articles and supporting our users. Our product is still evolving fast, so now we treat our content as a quick, iterative process. Support teams don’t always know everything about every single feature of the product and the myriad of ways those features work in conjunction with one another. Customers’ workflows vary greatly, and we are always learning about new ways our product is being used. 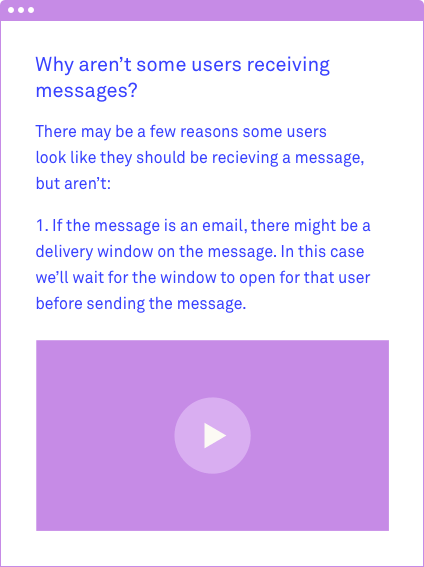 Intercom Articles lets us revisit old articles, add new sections, GIFS, videos etc. easily so we can add increasing value to older content rather than starting from scratch. 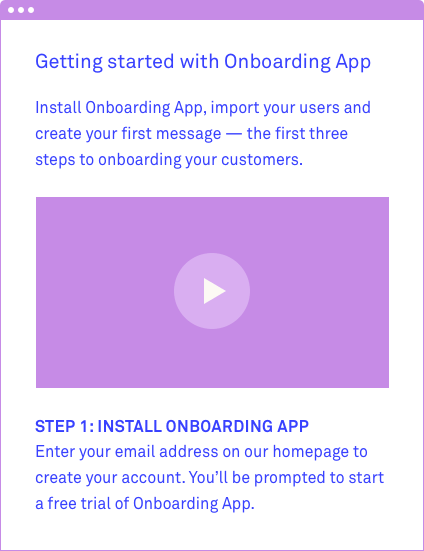 Our help center is only getting started, but we’re treating it as another part of our product, just like our onboarding experience and marketing campaigns around continued user education. They all serve the same purpose – helping to reduce the need for users to contact support teams and empowering them to make progress all by themselves.